Line 6 JM4 Looper Review – based on Question/Answer format so you can skip around to what you care about. Competitive Position: The Line 6 is in the middle of the pack, compared to other type 2 loopers, in terms of price and features. If you are interested in having some built-in FX, this may be a good unit for you. What is the price I should expect to pay for the Line 6 JM4 and how does that compare to other loopers? What is the main function of the Line 6 JM4? The main function is looping, but it also has a multitude of effects (FX). Can I record sound, continuously play a loop of that recording, and then layer additional tracks over the loop/phrase with the Line 6 JM4? Yes, the JM4 has basic looper functionality with unlimited overdub, controlled via footswitch. The process is to start recording, then < press Rec/Overdub> to begin looping what you have recorded, then to add your additional layer. You can continue to add layers or to stop the playback. How long can I record with the Line 6 JM4? The default JM4 can record 24 minutes, but you can increase that to over 6 hours by using a 2GB SD Card. How many memory locations (slots) are included in the Line 6 JM4? The default JM4 has 100 slots. Using the Line 6 JM4, can I learn by having an instrument teacher play something and then slow it down and work on matching the notes and gradually speeding up? Yes, with tempo control you can slow down or speed up the music and it’s an excellent way to learn. The JM4 has a footswitch setting that allows you to play the loop at half speed, controlled hands-free. Can I practice soloing with the Line 6 JM4? Can I use the Line 6 JM4 to capture quick song ideas to review later? Yes, this is a good device for that and can store up to >6 hrs of your music with an SD card. Can you switch to a different loop/slot while performing with the Line 6 JM4? Yes you can, but it requires several taps on multiple footswitches. It’s not as easy as with some of the other loopers. Also, we don’t believe that you are able to switch to another loop/slot without stopping the loop you are currently playing. Can you perform loop-to-loop queuing with the Line 6 JM4? Loop-to-loop queuing is when you are playing a current loop/slot and you switch to the next loop/slot without stopping the current. Then, when the current loop completes a playing cycle it automatically switches to the new loop you have selected. As we understand, with the JM4, you cannot switch to play a new loop without stopping the current loop completely. Can you switch back to the previous loop with while performing with the Line 6 JM4? Only if you save the previous loop and we can’t see how this would work well within a single song. You could potentially go into a phase of the song where the looper is not being used and then press the save button, then you could go to another slot to start with a fresh loop and then go back to the one you saved later on. With the Line 6 JM4, can I record and play different parts of a song (verse, chorus, bridge) all during a live performance while not using my hands (pedals and footswitches only)? We have not seen it done with this looper. We think you could go from loop 1 to loop 2 to loop 3 by tapping through the multi-step process and timing the transitions manually, but you would not be able to return to loop 1 unless you were able to press the save button (not a footswitch) prior to transitioning away. The alternative would be to set the Recorder Overdub Level to a low value so that you can add transition points to the song as you overdub, but this would obviously limit the number of overdubs you could record without forcing a transition in the song. Can I go from recording directly into overdub with the Line 6 JM4? Yes, you can go directly into overdub with the JM4 but it does require a double tap of the Rec/Overdub footswitch after you have recorded the first loop. Can I undo/redo the last overdub to change the song or eliminate a recording error with the Line 6 JM4? With the JM4, you are able to undo the last overdub, but not redo the last undo. Can I adjust the volume or effects of individual overdubs with the Line 6 JM4? With the JM4, you are able to set the volume to decrease on previously recorded layers as you overdub. This would allow you to transition the song (perhaps from verse, chorus, bridge) if used creatively with a large enough volume decrease. Also, you can save the loop and then overdub with the new settings. Another option is to toggle Input Select via footswitch and you could have different effects on the two main inputs: Mic and Guitar. Can I record individual overdubs/layers as individual WAV files to then work with in a DAW? With the JM4, you can use the Playback Level settings to accomplish this. Follow the process found in the Advanced Guide in the Workflow section. This is really a cool feature once you can get the hang of it. Can I use the 1/8” MP3/CD input to play song into the looper and incorporate it into my loop with the Line 6 JM4? Can I pre-record tracks, edit them in a DAW, load them into the Line6 JM4 as loops and then trigger them with the footswitch when needed? Yes, the JM4 is set up to take .WAV files via SD Card. Can I play multiple loops simultaneously with the Line 6 JM4, and turn them on and off? For example, play drums on one track, base-line on the other, and guitar on another and bring them in and out of the song (hands-free)? We see no way to accomplish this with the JM4 without going into playback settings, which you need to do with knobs and buttons (not hands-free). Can I play a loop or overdub in reverse with the Line 6 JM4? No, this feature is not included on the JM4. It is on several other looper models though. Does the Line 6 JM4 have stereo sound or just mono? The JM4 has a stereo output, but inputs are mono. Is there anything in the Line 6 JM4 that reduces the clicking sound that can occur when tapping the footswitch during overdub? Not that we are aware of, but this hasn’t been an issue with the JM4 like it is with other loopers. Is the Line 6 JM4 a good looper for live performances on stage? We would recommend other loopers for live stage performance. This model is better for home in our opinion. We like this model’s functionality for composing new songs, editing, porting to a DAW, practicing, learning and potentially video performances. Are their multiple stop modes in the Line 6 JM4? No we are not aware of fade-outs or other alternate stop modes with the JM4. Can you stutter start or DJ-scratch with the Line 6 JM4? No, we are not aware of any way to stutter start or DJ-scratch with the JM4 unless you add those effects to a WAV file within your DAW and then import via SD card. With the Line 6 JM4, are there any issues with droning (playing the same note, chord, repeated sounds, or tone-clusters continuously) at the boundaries of the loops – such as noticeable change in volume? We have not experienced or heard of an issue with droning using the JM4. Does the Line 6 JM4 have a built in metronome? There are many pre-loaded jam tracks, and the tempo of each one can be adjusted and displayed. Is there any software that comes with the Line 6 JM4? No software program for your computer is available with the JM4. As mentioned, firmware updates are made available on the Line 6 website. Also an independent user created a software (freeware) application that converts the Line 6 proprietary JAM files into commonly-used WAV files. Is quantize functionality available on the Line 6 JM4? Will the Line 6 JM4 interface with my DAW (digital audio workstation)/computer through USB? The JM4 does not function as an audio interface, it does not have a USB or other digital audio port. Will the Line 6 JM4 interface with my computer through USB to transfer sound files? No, you must use the removable SD card to transfer files between the computer and the JM4. Can I save and recall loops with SD card with the Line 6 JM4? Does the Line 6 JM4 have effects (FX)? Yes, this is a strong area for the JM4. The unit includes 12 amp models, vocal effects, delay, reverb, etc. Can I bypass the effects (FX) with the Line 6 JM4? Yes, but if you use the Guitar Input, you may still notice some color on the tone. Instead, you can use the Aux input. Can I turn off or mute the live signal that is fed through the Line 6 JM4 (for use in parallel effects loops of an amp or in Aux Send/Return of a mixer)? No, we are not aware of this functionality on the JM4. Can I save presets for effects with the Line 6 JM4? Yes, there are hundreds of pre-loaded presets and you can save 36 of your own. Does the Line 6 JM4 have an XLR mic input? Does it have phantom power for a condenser microphone? Yes, the JM4 has an XLR input, however it does not have phantom power so you can’t connect a condenser microphone that requires phantom power without an added mic pre-amp (like a Tube MP). Does the Line 6 JM4 function as a mixer with multiple inputs? Partially. There are four inputs: Mic XLR, Guitar 1/4”, CD/MP3 1/8”, and Aux 1/4”. However, the CD/MP3 is mixed with the Mic input. The Aux could be mixed with either Mic or Guitar. However, you can’t record a loop with Guitar and Mic at the same time. You must select one with the Record Select function. During loop playback, you can adjust the volume of your backing track/song/drums separately from the Guitar input and separately from the Mic/Aux input. Can I re-assign footswitch functionality with the Line 6 JM4? The JM4 has four footswitches. You cannot permanently re-assign the footswitch functionality, but you can access five alternate modes where they perform different functions. You switch modes by pressing the fourth footswitch. There is the “Jam Control Mode” that is the main mode for operating the looper station – rec/overdub, play/stop, and undo. There is the “Loop FX Mode” that allows you to toggle the loop between at ½ speed or full speed. There is the “Record Select Mode” that allows you to switch between slots and choose input (Guitar or Mic) for recording. There is “Guitar Preset Mode” where you choose a preset (pre-loaded or user-saved) and also Tap Tempo/Tuner functionality. Finally, there is the “Amp Model/FX Mode” where you can select and turn on an Amp Model or turn the Delay on/off. Does the (insert name) have a headphone jack for playback and monitoring? Yes the JM4 has a dedicated 1/8” jack for headphones. Can the Line 6 JM4 be connected to an external MIDI device? No the JM4 does not have MIDI ports. Does Line 6 release firmware updates for the JM4? Is there an optional footswitch that I can add to the Line 6 JM4 to increase functionality? No, we are not aware of any optional footswitch that can be used with the JM4 to expand hands-free control. Nor do we see an input jack that would accommodate one on the unit. However, the JM4 does have five different modes for the set of four footswitches that it does have. Is there an optional expressional pedal that I can add to the Line 6 JM4 to control effects(FX)? No, there is not a way to connect an expression pedal to the JM4 that would control the JM4 effects hands-free. You must control via the “select knob”. For the JM4, we were not able to find this information. Usually this is shown the specification section of the manual for a looper pedal. That section is not included in either manual that we have found, or on the Line 6 product website. Can the Line 6 JM4 be battery powered? No there are no battery options for the Line 6 JM4. How is the warranty for the Line 6 JM4? The JM4 has a standard 1 year warranty through Line 6. What size is the Line 6 JM4? 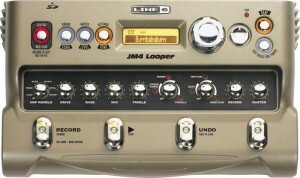 The JM4 is one of the larger looper stompboxes. It weighs 4.1 lbs. It’s footprint is 12.5” x 7.5” and is 3.25” tall. Why is using a Line 6 JM4 better than just using computer software? Or why should I use a stompbox looper instead of something that is software based? Why is using a Line 6 JM4 better than just using an iPhone or iPad application? 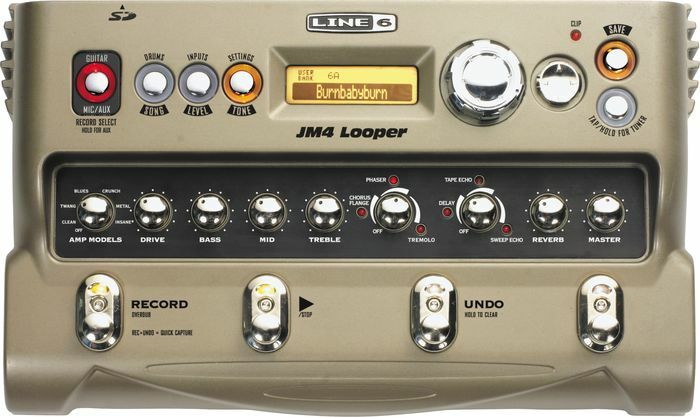 There is very limited functionality with the iOS based loopers compared to the Line 6 JM4. However, these apps are quickly improving. With added hardware (microphone, Bluetooth control pedal, etc. ), these setups may start to look attractive. Please see our iOS app setup information. What company makes the Line 6 JM4 and where are they located? How is the support from Line 6 on any issues that arise with the unit? In order to help you do these things, Line 6 has a few manuals out there. Also, there is a forum (called a knowledge base) on their website where you can post questions and get them answered by experts. We have the impression that Line 6 is easy to work with on warranty items, as well. How long has the Line 6 JM4 been in production? According to this press release, it started to ship in August 2008.